When we set an intention for ourselves, do we also set an intention for the world? Are we so connected that just our thoughts can set something in motion that we might not even be able to fathom? Something beyond just ourselves? Each of us is energy. Energy that is connected. But energy that is also individuated. Our thoughts and emotions are also energy. Emotions = energy in motion. So where does that energy go? After all, energy cannot ever die. It can only change form. So when we intend something, what happens? Does anyone really know? In my own life, I have set many intentions. One of which is to help others who have come from adversity. In particular, child abuse. But what I do to help others cannot ever be measured. Not in any empirical sense. But I know in my heart that when I reach out to someone in some way, there is an effect. An intangible effect. But an effect just the same. When we set the intention to raise a child in a certain way, we affect how that child will engage with the world. Not just as an end result. But throughout the process. Because that child will interact with us and others and affect everyone s/he engages with. 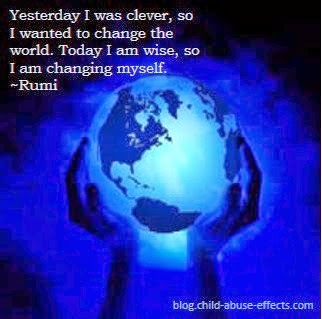 When we set the intention to change ourselves in some way rather than decide to change the world, the world does change. It has to because we are a part of it. We are directly connected to it. When we show kindness, we are positively affected. Not just in how it feels to be kind. But by the Universe. Anonymously perform acts of kindness, without expecting anything in return, not even a thank-you. The universal all-creating Spirit responds to acts of kindness with the response: "How may I be kind to you?" The person on the receiving end of kindness is also positively affected. And that positivity reaches out to others. And so on and so on and so on. When we love ourselves, we set the stage for how others will treat us. But the intention must first be to treat ourselves with the dignity and respect and love we deserve. So, my answer is a resounding yes. I believe we do set an intention for the world when we set one for ourselves. How can we not?